With Hydro-Paddle technology to go along with a Dry Performance Sector, the Dunlop SP Sport Signature is a serious high performance all-season tire for all types of weather conditions. The Hydro-Paddle designs features unique tread grooves that work to propel water from under the tire. The silica tread compound, along with full depth sipes, improve handling on rain soaked roads to give you added confidence. The Dry Performance Sector as Dunlop has named it, gives this tire a broader shoulder rib and solid center rib to enhance cornering capabilities, something that driving enthusiasts can appreciate. In addition, you can find this Dunlop tire with an optional W and Y speed rating. The Dunlop SP Sport Signature ranges in price from approximately $105 – $200. Who Is This Tire For? Dunlop Signature tires are designed for drivers who have sports cars and high performance sedans, and are looking for year round performance in all types of weather conditions. 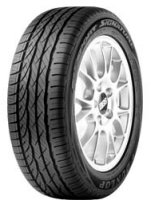 Dunlop includes a 6 years/60,000 mile treadlife warranty on the H & V speed rated SP Sport Signature tires. The uniformity warranty is for 6 months free replacement or first 2/32″ wear. Materials and workmanship is for 6 years and free replacement the first year or 2/32″ wear, prorated thereafter. Dunlop has also added a 30 day pledge and a 2 year roadside plan with the tire.